With a little distance from the wedding, it is much easier now to pull out my favorite parts of the day. I think number one with a bullet was when we read and signed the Ketubah. 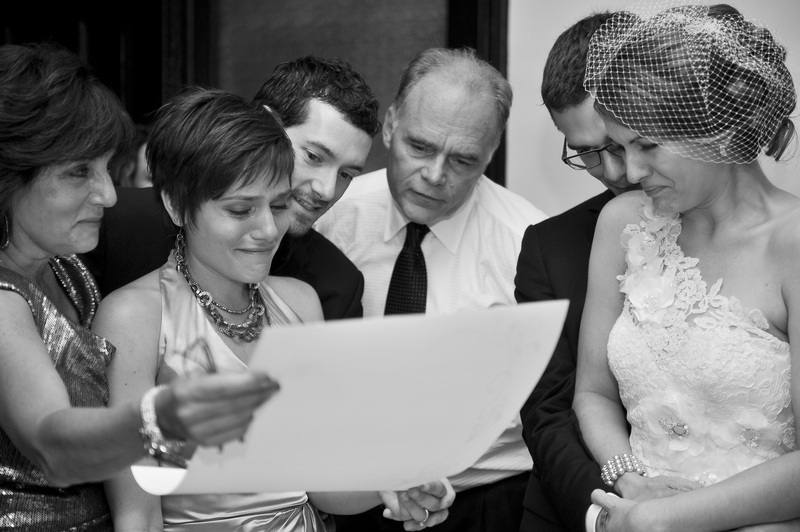 On top of the undeniable awesome heart squeeze of “this is the moment I get married,” reading the ketubah was powerful for me because I was literally surrounded by family and friends, in tight, informal proximity. Wrapped in Collin’s arms, with all my nearest and dearest a grasp away. And then there were the beautiful words of the document itself. When it came time to select ketubah text, I was extremely overwhelmed by wedding planning so my mother-in-law and sister-in-law offered to hunt for me. We gave them some pretty restrictive guidelines: nothing sexist and only minimal emphasis on the promise to have a Jewish household (because of the aforementioned ultra-reformness). They found the perfect text for us. It even uses the word “awesome.” It’s all about our marriage and our home being wonderful because it is built on our love and mutual respect. You can read the whole thing here. And the part of me that drove me to go to law school sure does love that after this deeply emotional moment everyone has to bust out the pens and sign along the dotted line, because it is a contract after all. 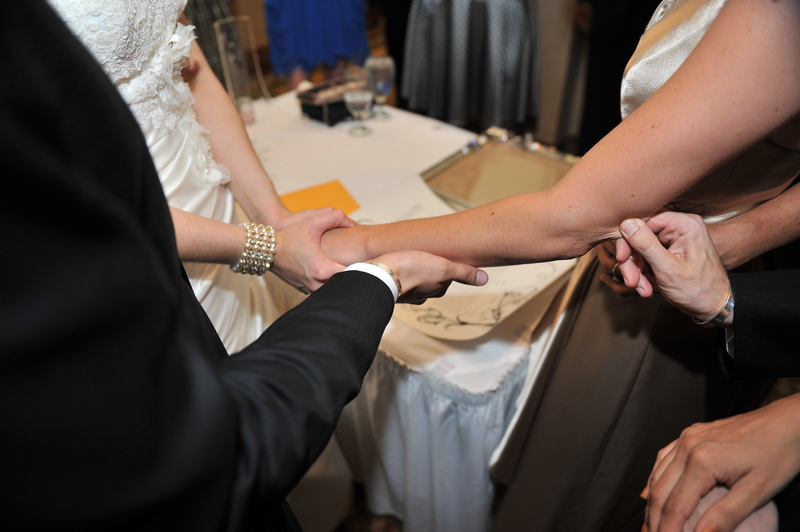 After the signing, my friend and photographer Louis, who is also Jewish, hugged me and said, “You’re married now.” I whispered back, “I know.” And it was a great feeling. Carrie embellished the printing with the same design flourish we used on our invitations and programs, and Vicki made a decorative frame with some leftover costume jewelry from the construction of our brooch bouquets. We hang it on our wall with pride and I find myself looking at it at both the best times of our marriage and the hardest times, as a constant reminder of what this all means, and how truly awesome it is. All photos by Louis Stein. 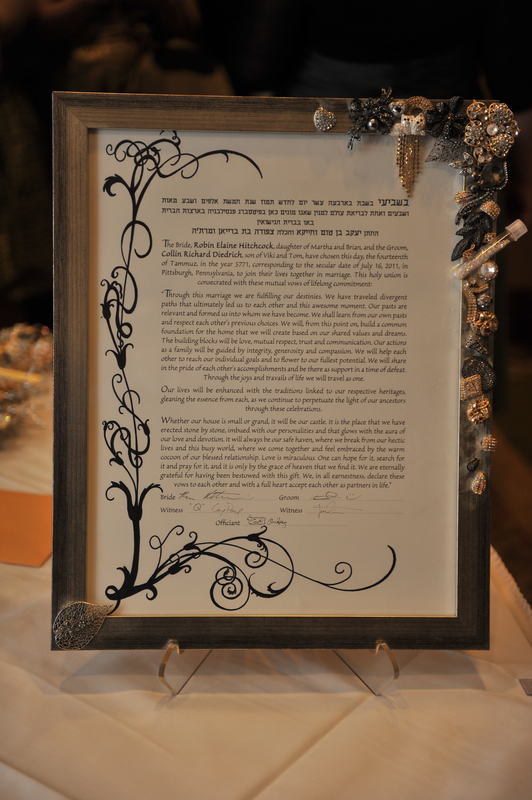 What BEAUTIFUL language in that Ketubah. And what a beautiful symbol to be truly married “Wrapped in Collin’s arms, with all my nearest and dearest a grasp away.” Sigh. Judaism has such lovely traditions. That text is BEAUTIFUL. Wow. It’s the first time I have ever read a ketubah that I thought we could use. 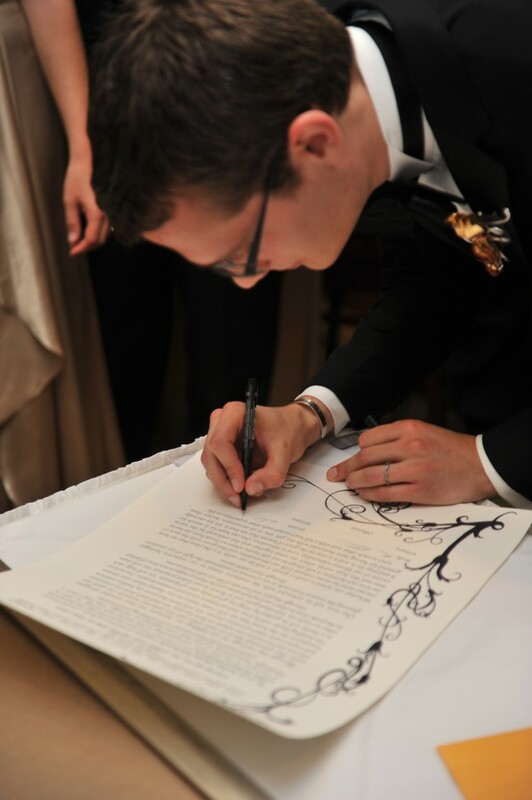 If you want to improve your know-how Flashback Friday: Reading the Ketubah | HitchDied only keep visiting this web page and be updated with the newest news update posted here.